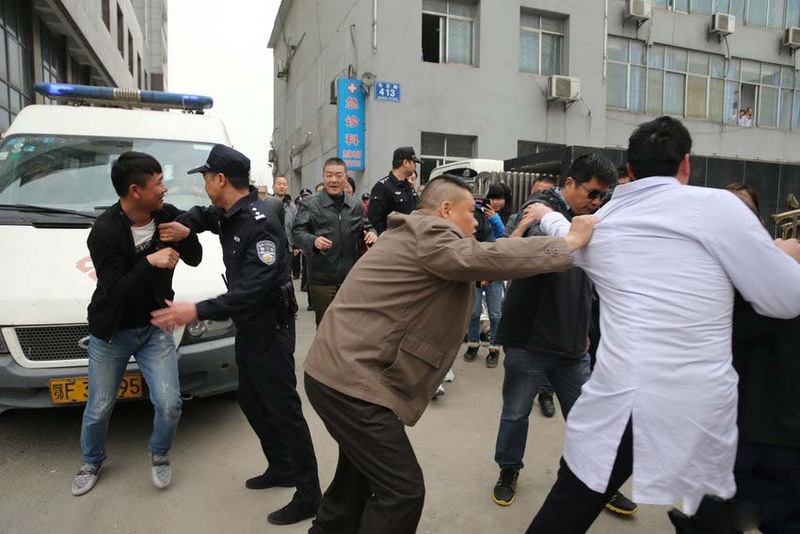 As I've said many times on this site, the level of violence against medical staff in China is extraordinary. In one province, Guangdong, there were 25,000 recorded incidents last year alone. Many reasons have been put forward by academics and politicians to explain the epidemic of violence - but there has been little actual study of the contributing factors. Now researchers have interviewed patients and medical staff in seven Guangdong hospitals to get some feedback from the grassroots. The results of the survey are published in the BMJ this month and one theme emerges: mistrust. The survey found that there was widespread mistrust of doctors and healthcare staff by the public, based on well-grounded beliefs that there was widespread injustice and commercial bias in the Chinese healthcare system. Patients believed that decisions on their treatment were based more on hospital revenue than need, while at the same feeling resentment that they had to wait for hours to see a doctor for just a few minutes. Costs and financial injustice were a major source of anger: people cited examples of patients being refused treatment - or having treatment terminated due to inability to pay fees. Doctors also believed there were major injustices in the healthcare system - saying their workloads were far too high and the salaries did not reflect their years of training, long hours and high pressure. They also said that they did not trust patients to behave in a civilised manner, with many being demanding or suspicious. Patients had little trust in the official dispute resolution systems. They believed that hospitals and law courts were unlikely to give time or serious attention to patient complaints and felt there was little chance of redress for any deficiencies or mistakes. For this reason, patients said they would be more likely to get a result - an apology and compensation - if they used physical and verbal threats, disruption of the hospital and violence to gain attention. The survey also heard from doctors that their training had not prepared the for communicating with patients or having a good bedside manner. Both patients and physicians were critical of the government's response to rising violence - namely increasing levels of security guards at hospitals. They said this just inflamed the situation, creating a siege them-and-us mentality and did little to address sudden violent assaults on staff. The researchers - including several China-based doctors - are openly scathing about the policy response from Xi Jnping and his administration. "The moral crisis that our study revealed in Chinese healthcare demands a legal and regulatory response as well as a moral one. The Chinese phrase “zhibiao bu zhiben” means treating the symptoms and not the disease. Cracking down on violence and enhancing security measures are unlikely to fundamentally alter patient–physician mistrust and may inadvertently undermine trust." They put forward three policy suggestions to tackle the climate of mistrust that is driving the violence in healthcare. Firstly they say hospital 'commissions' and incentives to staff for overservicing must be abolished and financial conflicts of interest must be addressed. Second, doctors and hospital staff need better training in communication, ethics, professionalism and dispute resolution. Finally, there needs to be an atmosphere of trust in which the public are willing to negotiate and seek non-violent solutions, while doctors must be willing to apologise to patient families and accept reasonable consequences for medical error. st. Similar findings were made in a separate study of junior doctors in three Nanjing hospitals recently. The study found that junior doctors felt extremely frustrated at having studied for up to a decade but having only a lowly job title and poor pay. The doctors said they worked extremely long hours and had high pressure in their work, but also faced poor prospect for promotion or increasing their income. The other main finding was that most junior doctors had experience of abuse and violence from the public, and this was a major contributor to poor quality of life. "Although Chinese doctors feel relatively unsafe, the phenomenon does not raise sufficient concern from hospital managers . These violent events negatively affect medical workers; for instance, these workers may develop guilt and self-doubt, and such outcomes can reduce the quality of services," the study authors note.